So many homeowners are too stressed out because of clutter. They may not realize it, but living in a house filled with knick-knacks or maybe even items that should have been thrown out a while ago affects physical well-being and mental health. This also has a significant effect on lifestyle and habits. If your home is very messy, then you wouldn’t want visitors around. So, how do you keep things organized? Below are a few tips. Now that you are getting ready to de-clutter, the first step is to see what needs to be done. This will require you to examine every inch of your property. With a pen and paper in hand, walk around your house. See what items are cluttering your patio, pool area or yard. Then, check every room inside your home and write down what areas need to be put in order. This method will help you in planning what area to sort out first, and it will also allow you to decide on what kind of storage containers you require. Tackling everything at the same time will surely make you overwhelmed. So, fix problem areas one at a time. Decide where you want to start. If you have decided to work indoors, choose which room to arrange first. Then, have trash bags and storage containers ready to make sorting faster. This is the sorting stage wherein you have to determine what stays and what goes. Make separate piles for each. The things that you want to dispose of can go to the trash. If these are still usable, you can sell them or donate them to charity. If you have things that you want to keep but your space is too limited, you can rent a space where you can store these things until such time that you want to use them again. Maybe you’d also like to save a few memorable items for your kids or grandchildren. If you have room at home, you can put these in secure boxes and keep them in your attic or basement. For the things that are going to stay in your house, you have to consider where to put these. Every item must have its own place so that it’ll be easy to put it away when you’re not using it. Also, make sure to return things to where they’re supposed to be. Don’t allow items to pile up because it takes double the effort to reorganize all the stuff. When arranging your belongings, you should also consider getting new cabinets or putting up new shelves. Maybe you can also purchase new dressers so that you have more storage space for all of your possessions. This is easier said than done. However, after you have organized your home, you can avoid disorder by making sure that each and every item is in its right place. Once you notice that things are piling up in a corner, tackle the problem right away. Aside from this, think carefully about the items that you bring into your home. Don’t be an impulse buyer. When shopping, consider an item’s utility. Do you really need another set of teacups or do you just want to buy them because they’re 50% off? 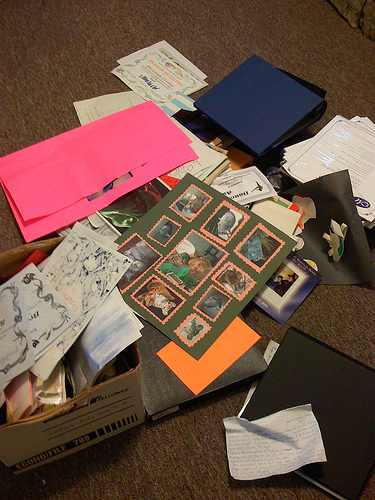 There will be fewer items that would cause clutter if you are more careful about what you bring inside your house. The article is by Claire Kurt, a freelancer who regularly blogs about lifestyle and home improvement issues. A number of her articles are about US storage centers in Phoenix, and her aim is to offer information about home organization options.